An interview with Nico from the long-lived French Oi! / RAC band Lemovice. Can you start with an introduction of your band to Sweden? Greetings, I am Nico from the band Lemovice. The band have been in exist since 1999, and we come from Limoges, an average city in the center of France. 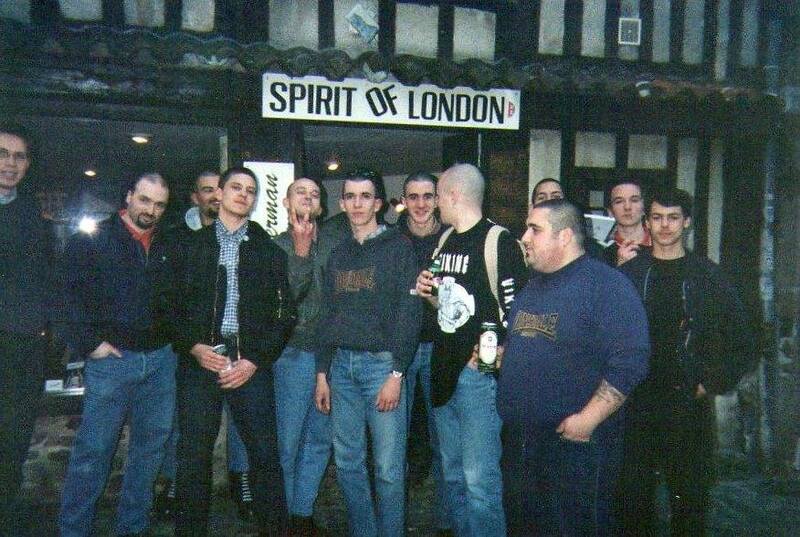 At the time "Gros Mike" (his nickname) who was to become the first singer of the group, he held a shop of English clothes called "Sprit of London" largely frequented by local skins. At that time, I was playing the guitar in a punk rock band called Dernier Combat and I became friends with Mike and the rest of the band. The idea soon came to us as a band and since I was interested in politics and oriented towards nationalism, we became a band of RAC, the first in our city. We recruited a bassist from the band of the Spirit of London and a drummer who had nothing to do with the Skinhead movement but was in the same high school as me. We started the rehearsals and the wheels where set in motion. In early 2000, we returned to the studio to record 2 tracks for a French compilation "France Explosion 3". In 2001, a title for the tribute of Bunker 84, and in 2002, we attacked the concerts. The first of course in our city Limoges, and after that we continued to play all over France, Paris, Lyon, Brittany, Pau, Lille and a long list etc.... In 2003, David and John, respectively bassist and drummer, left the band to be replaced by Goglhead and Waf, who were also part of the team called "Lemovice crew" since the Spirit of London shop closed in 2001. In 2005 we were invited to play in London for B&H, but at that time Mike had some concerns with the court and preferred to quit the band. I then took over the vocals while continuing on the guitar. So, I became Lemovice's only original member. The concerts continued, then we released our first album in 2006 "Lemovice". From 2008, we started playing more often abroad. 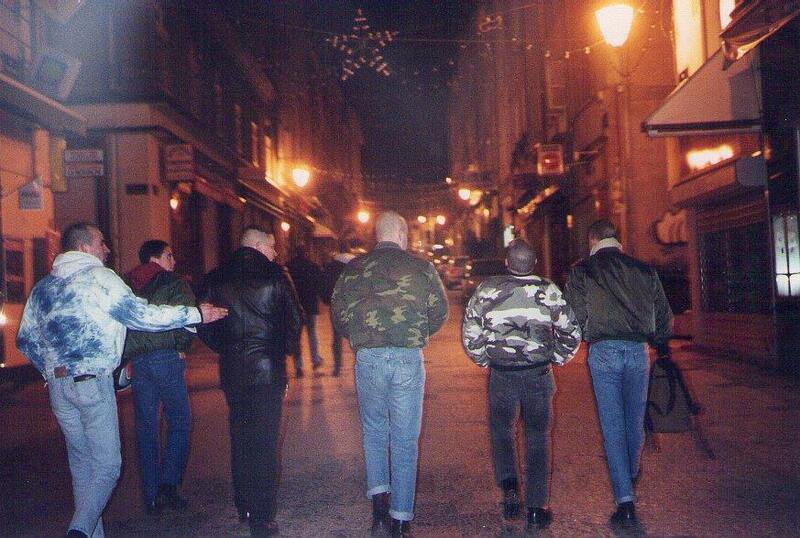 Our second production "Skinhead Living Dead" was released in 2009 at Patriote Production. In 2011, the band again changed completely with the arrival of Flo on drums, Björn on guitar, Snorr on second guitar and Marc Crapüd on bass. This was done little by little. The training was not done in one year. I put down the guitar to focus myself on to singing on stage. Also in 2011, the release of "Oi le Tribute", album in tribute to the French Oi / RAC bands of the 80s. In 2012, a split with Nessuna Resa. Then, in 2013, the release of our last album "Le Front des Patriotes", produced by our friend Maly from Poland that I greet. 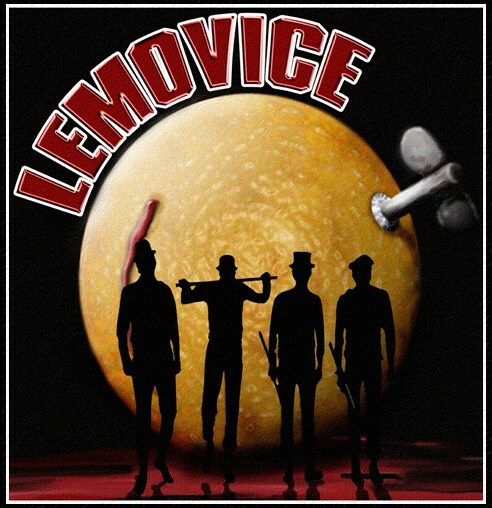 Here is a short presentation of the band Lemovice. What is the source of inspiration for the music, lyrics and activity of Lemovice? Like any political group, we draw inspiration from daily life and it is not difficult to find themes. Uncontrolled immigration, globalization, extreme left, Americanization of the spirit, the end of our society as we have known, survival. But also of our city, friendship, camaraderie, festivals etc. Musically, for my part, I draw my inspiration from all these Punk and Oi! 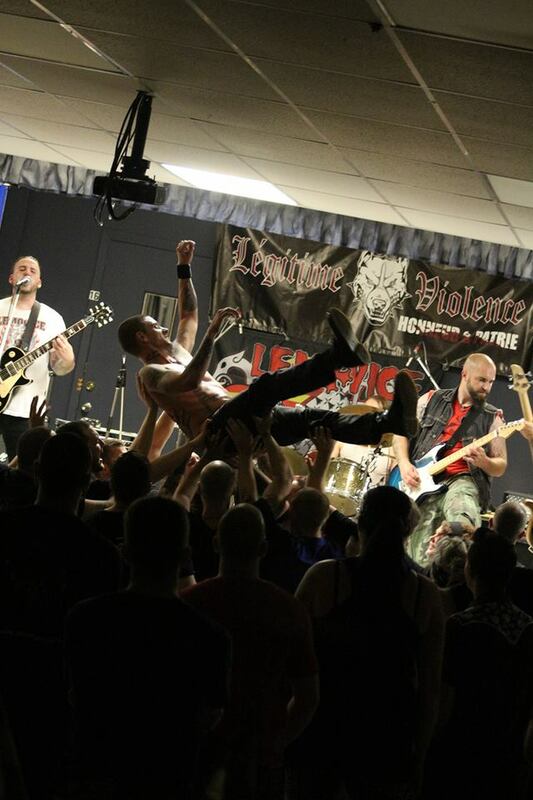 bands that I listened to as a teenager: Exploited, Decibelios, GBH, Silens Camera, Brutal Combat, Demented are go, No Remorse, Fortress... Members of the band coming from the Metal scene, they have given wide that hard rock touch that is present on our last album. Concerning our next album, I know that I will return to a sound more Rock'n'Roll because it is really what I like to play and compose. Finally, regarding the words, Lemovice never poured into useless provocation. Wanting to cling to the reality of our time, we speak freely of street fighting or political struggle, but we do not shed nostalgia for the Third Reich. Trying to write posed realistic texts has always been important to us. What do you think about the situation in France with the terrorist attacks? The situation is clearly catastrophic in France. In recent years, the attacks have not stopped since 2015 and there are hundreds of victims. France continues to welcome all these floods of ultra-Islamized immigrants. There are now also illegal immigrants in small French towns. There is clearly no work for youth, not enough housing. Radical Islam now dominates in many areas of lawlessness. The Government has set up a system of systematic check-in and checking of persons qualified as extreme. This device is basically against the Islamists, but it more often serves to pose problems for nationalists like me. Our country has a strong history over a millennium. Indeed, it has its identity thanks to characters like Clovis, Charles Martel, Jeanne D'Arc, Napoleon and so many others. Also by Christianity, dogma that has welded our people for so many centuries. We will not submit to this government or to Islamic laws, we do not intend to give up. In France, however, we have the chance to have the National Front, which I hope will take power. We also have strong nationalist media that are beginning to weigh in the representation of our anti-system struggle and more and more people are getting aware of it. Many small local groups are organizing to raise awareness of the invasion. All is not lost. You have done some music videos. Was it a fun thing to implement? First of all, if we made clips it was to reach more people. And we are quite satisfied with the result! These videos have allowed us to become better known around the world. The shooting of the clip “Casus Belli” was actually funny enough to shoot. We filmed part of the clip in a huge abandoned factory. That day, it was raining so much that we had to tinker with a bridge to get to the site because the current had taken everything away. The rest of the clip was filmed in a squat, later in our rehearsal room and finally in the center of Limoges where, to the surprise of the passers-by, we sing the chorus of the chorus to make sequences. This clip was produced with few means but I hope to produce a professional clip for the next album. You have also been on stage several of times. Which one has been the most memorable? I always quote the same concert, that one in London 2005. It was our first overseas concert, the first one I sang. I had a huge fright. We were playing in the bar of the singer of the ex-Ovaltinees, when, arriving in the zone near the concert, we fell on a group of English skins, completely tattooed in the face, we thought we had arrived in the country of the Skinheads :-). In the evening, we started playing after the German band Faustrecht. The English audience reacted well to our songs and we had a good atmosphere. I must confess that we were proud to play and to be able to represent ourselves elsewhere than in France. The singer of Avalon even came to interpret a song of No Remorse on our side. Great moment for Lemovice. And how is it to get on stage outside France where the audience do not understand your lyrics because of the language? This is not a problem. Those who invite us like the French sound and in countries like Poland, or recently in Brazil, the audience even knows our words and chants the choruses with us. I think it's huge and we're proud when it happens. And then in concerts we often make covers of old English bands, which helps to get closer to people and motivate them. And we try to translate the lyrics of Lemovice into our CD booklets for a broader understanding. What is the situation in France in the music scene right now? Bad. I would not have said that a few months ago, but the government attacked the "Blood and Honour Hexagone" which organized the biggest concerts and put them several of these members in trial. I know that they are irreproachable, reliable source, but given that they organized concerts in France with always more people. For that, the French government decided to put them out of harm. Since that there are far fewer concerts, and other organizations do not attract as many people. We had already had the case Méric (an antifa killed in 2013 by a skin from Paris) and the State had banned several nationalist organizations and prevented all our gatherings on the streets. In France, there has always been an enormous nationalist potential, but successive governments have always ensured that our freedom of expression is nil. It is thus and it is necessary to do with, as long as there are not patriots at the Elysium we will always be gagged. Against what, and in support of what, does Lemovice fight and exist? Against what... Hahaha it could be a long list! The miscegenation, the loss of our culture, our identity, against the extreme left-wing that is truly a cancer for humanity, against anti-Christian acts, against Europe as it has been done, against the interference of the American government and I could still write many. Lemovice exists for friendship, already it must be known that this group is not only a band but a band of friends, a concert organization and a political group. We exist because we still want to continue the nationalist musical struggle that begun with Ian Stuart. Because culture must not belong to the left, we are capable and we have proved that we can create an autonomous scene of counter-culture despite all repression. What is the next plans for you now? The year 2017 will not be very prolific for Lemovice, I decided to stop the concerts to write a new album that should be released in 2018, I think to seek a label for a co-production of a CD, if anyone is interested? The album will be called "Barricade" and I think it will be the last one from the band, it's going to be 20 years of the group existence. I think I have made the rounds of what was possible to do in our scene. However, this year "Le Front des Patriotes" will be released on LP. As a friend of the Swedish comrades and people, I know that like the French people you live in difficult times with the invasion coming from African countries and Islamism. Nothing is lost yet, I think that with a handful of determined men we can always change things! And I also wish Lemovice could play one day in your country!